Fresh off of their first appearance at SXSW, Portland's Radiation City have been working their way back home up the West Coast since departing the anointed indie fest in mid-March. Down in Austin, Rad City played seven shows in four days, including The Portland Party (which we threw for ourselves, damn it! ), and, although they just released their debut LP in September, they've been playing plenty of new material from their new EP, Cool Nightmare, which will be released on April 10th via Tender Loving Empire. The full-length, The Hands That Take You, was largely the efforts of Rad City creators and couple Cameron Spies and Lizzy Ellison, but the latest seven-track EP sees contributions from three additional members: Matt Rafferty, Randy Bemrose, and the newest addition, Patti King. With Cool Nightmare, there's an intriguing story of finding inspiration in a decrepit piano before destroying it, documenting the whole process audibly and visually, and sharing some mementos of this exercise with fans. To understand the ideas and muse behind this eerily bewitching EP, which is also full of "dream-like ambience and warmth," OMN spoke to Cameron Spies before the band returns to the NW in the beginning of April for two Oregon shows: Sunday, April 1st at Sam Bonds in Eugene and a free EP release party at Rontoms in Portland on Sunday, April 8th with Seattle's Legendary Oaks. Two months ago, you released a music video for "Find it of Use" (below), which featured the destruction of a piano. Tell me the story behind your new EP and that piano's role. The imagery for this record involves this piano that lived in Randy's basement. We recorded a lot of the piano tracks for the album [using this piano], and by the completion of the record, the piano was essentially useless—a ragged heap wasting away in the dark. We decided it would be best to give it new life through its destruction. We captured audio of a decent amount of the moving/smashing part of the process for use as samples on the record or for use in later recordings (hence the title "Find it of Use," I guess, although the song title came first). That imagery is not an accident though. The record evokes the idea of destruction and rebirth through a gentle tug of war between darkness and levity. how do you know when it's time to hire your first employee? It's frequently estimated that the cost of recruiting, hiring and training a new employee can cost a business $4,000 (or more), which is often anywhere from 25 percent to 200 percent of annual compensation for that new worker. As industrious and multi-talented as you may be, if your goal is to grow your business, and have a life outside of it, the reality is that you can't do it all. At some point you need to assess when the benefits of hiring another person will outweigh the cost of doing everything yourself. There's plenty of legal, financial and individual preparation that goes into adding another mind, body and personality to the operation of your business, but let's start with assessment. How do you know when it's time to hire your first employee? If you run a boutique, bakery or restaurant, it's probably important for you to be open, selling, producing or serving your goods, six to seven days a week. Thus, many small business owners must hire their first employee right out of the gate. "You can't do everything yourself" and keep your sanity, insists Jennifer Thomas of Jet Clothing, especially when you have a storefront that needs to be open seven days a week. Erica Lurie of Garnish Apparel echoes this sentiment. 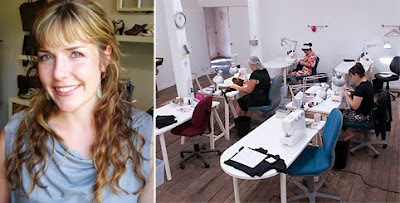 "I knew it was time to hire my first employee when I first opened my shop and decided that I wanted to be open seven days a week, but didn't want to work seven days a week," she says. "Since an article of clothing is a comparable price to a day's wages, on any day of the week someone might come in and make a large purchase that covers your payroll for several days. So, I figured that until I had enough data to analyze accurately if there was a day of the week that was consistently not profitable, I ought to be open seven days. As it turned out, it makes sense financially to be open every day." Look at an average day at your business: What do you spend your time on? Make a list of what you do, and how much time it takes. Are you spending your time developing your business and finding new clients or doing all the routine tasks that could be done by someone else? Are you spending your time on tasks that generate revenue? Are you still wearing all the hats? Could you delegate some tasks, like hiring a bookkeeper? Find out how to spend your time where it's most valuable and more about assessing when to hire your first employee on Neighborhood Notes. 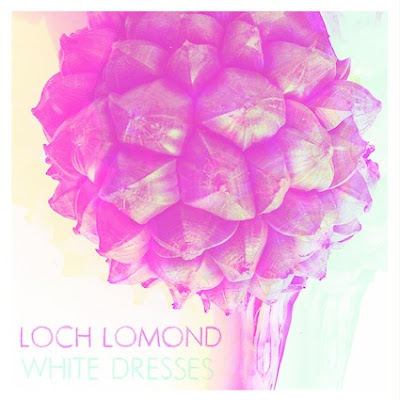 There wasn't much fanfare surrounding Loch Lomond's latest EP release on March 5th—at least not around these parts. And maybe that's because it wasn't intended for us. In fact, the five-track EP White Dresses was recorded specifically for their latest European tour, which wrapped up on March 10th, and released only on their European imprint, the Glasgow, Scotland-based Chemikal Underground. Just over a year after releasing their second album, Little Me Will Start A Storm on Tender Loving Empire, it's not been uncommon for the band to frenziedly record a single or an entire EP during the time in between full-length LPs. 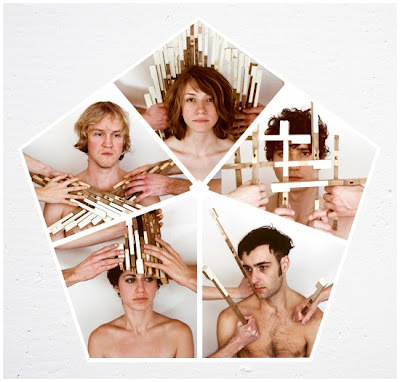 Two thousand nine's EP Night Bats was pulled together in six days, two years after the debut, Paper The Walls, but two years before Little Me, and as lead singer and songwriter Ritchie Young put it, the EP was done "kind of to prove to ourselves that we could do something fast and good." The story behind White Dresses is similar. "Our last record, Little Me Will Start A Storm, took two years to complete," Young says. "Chemikal Underground asked us to give them an acoustic EP just for this tour. We found ourselves recording essentially one-third of the new record in 16 days. It felt so wonderful to be able to complete this without second-guessing ourselves and just going for it." The typical elements are here with Young's distinctive, emotive vocals guiding the delicate but robust chamber-pop symphony of familiar but curious and childlike sounds, provided by bells and glockenspiel touches. There's history and drama in the violin and support from the chorus of backing harmonies, which add another, weaving layer to exquisite hush. Young explains that this EP is essentially a piece, or preview, of their upcoming record. "We are going back to the wonderful people that helped us record and mix White Dresses to flesh the current songs out and finish the record for release in the US." That includes Tony Lash (Elliott Smith/The Dandy Warhols), Kevin Robinson (Viva Voce) and Douglas Jenkins (The Portland Cello Project), who Young says "are amazingly talented people and I am very excited to see how the rest of the record will play out." As for White Dresses, there's a fleeting moment on the opening track "Inventing You" that feels like The Decemberists but the following song, "Kicking With Your Feet" (below), is all Young's, full of wispy androgyny in the vocals, which are calming and piercing, often at the same time. The title track is spiritual and the closer "Your Eyes" has all the qualities of a future LL single, which it's surely guaranteed to be. Back in the NW, the lineup of Ritchie Young (vocals, guitar, violin) and his brother Michael Young (drums) as well as Jade "Brings Plenty" Eckler (vocals, glock), Jason Leonard (guitar, bells), Brooke Parrott (vocals, keyboard), and Dave Depper (vocals, bass) will visit Boise (for the Treefort Music Fest) and Seattle before two Oregon homecoming shows in Cottage Grove at the Axe & Fiddle with Brooklyn's Dinosaur Feathers on Saturday, March 24th and in Portland at Mississippi Studios on Sunday, March 25th with Dinosaur Feathers and Seattle's Lemolo. These shows are your only chances to get your American mitts on a physical copy of White Dresses as Young tells, "We brought over 100 copies just to sell at these four shows." Hailing from disparate sides of the States, it took a rare Portland, Oregon, snowstorm to birth the foot-stompin', ramblin' country rock of Lone Madrone when neighbors and founding members Tucker (guitar, vocals, drums/percussion, piano, glockenspiel) and Paxton Scott (electric/upright bass, backing vocals), in an effort to combat cabin fever, started jamming together, quickly penning a few tunes. Come spring and summer of 2011, the duo enlisted lead guitarist Michael Bateman and drummer James Phillips (Bombadil), and the group began to self-record and produce its debut album, A Safe Heart, between homes in Eugene and Portland. Phillips recorded and mixed most of the album before returning to Bombadil (Ramseur Records), but Lone Madrone picked up Erich Spielman in his stead and self-released A Safe Heart on November 12th, 2011 at The Piano Fort. Out of that first long winter came the standout track "Sleep" inspired by "the desperate need for spring after a particularly long winter." The tale begins cold, with slushy, odd-metered blues that represent the grind winter can cause, but the quick, upbeat swing transition about a minute in reminds you that spring is inevitable, while the final section ushers in the long-awaited return of warmth and light with the lyric "Go back to sleep, I’ll be with you tonight." While A Safe Heart moves from twangy ditties—like the French-peppered, Lafayette- and Luke Skywalker-inspired "Fishin' Boat"—to alt-country jams—the punky romp of "Mine Diamond" or the gritty love song "Victory Dance"—to tender touches from a delicate cello (Josh Starmer) on the brief "Take A Stand" followed by the ever-present pedal steel (Paul Brainard) on "Tidewater," the musical influences are vast. Although plenty of youthful teeth were cut in punk rock and cover bands, it's Scott's time in Louisiana with Delta blues, Cajun and zydeco music and Tucker's percussionary travels to lands like Brazil—where he studied samba percussion—and Turkey plus matured interests in old jazz and swing that add depth to Lone Madrone's sound. 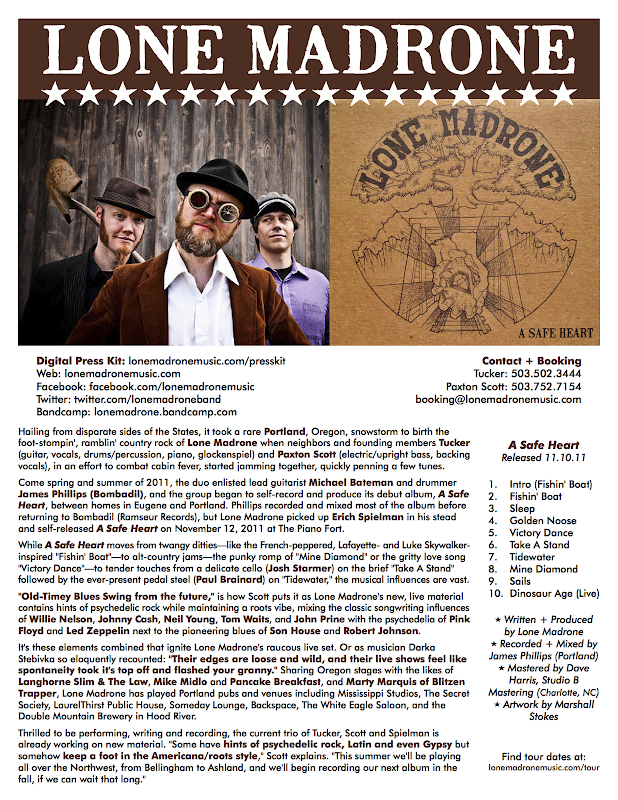 "Old-Timey Blues Swing from the future," is how Scott puts it as Lone Madrone's new, live material contains hints of psychedelic rock while maintaining a roots vibe, mixing the classic songwriting influences of Willie Nelson, Johnny Cash, Neil Young, Tom Waits, and John Prine with the psychedelia of Pink Floyd and Led Zeppelin next to the pioneering blues of Son House and Robert Johnson. It's these elements combined that ignite Lone Madrone's raucous live set. Or as musician Darka Stebivka so eloquently recounted: "Their edges are loose and wild, and their live shows feel like spontaneity took it's top off and flashed your granny." Sharing Oregon stages with the likes of Langhorne Slim & The Law, Mike Midlo and Pancake Breakfast, and Marty Marquis of Blitzen Trapper, Lone Madrone has played Portland pubs and venues including Mississippi Studios, The Secret Society, LaurelThirst Public House, Someday Lounge, Backspace, The White Eagle Saloon, and the Double Mountain Brewery in Hood River. Thrilled to be performing, writing and recording, the current trio of Tucker, Scott and Spielman is already working on new material. "Some have hints of psychedelic rock, Latin and even Gypsy but somehow keep a foot in the Americana/roots style," Scott explains. "This summer we'll be playing all over the Northwest, from Bellingham to Ashland, and we'll begin recording our next album in the fall, if we can wait that long." 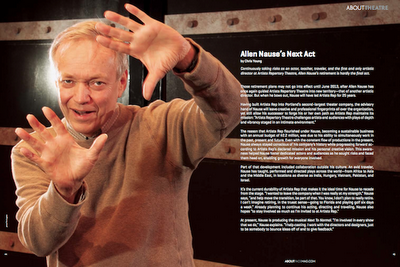 Continuously taking risks as an actor, teacher, traveler, and the first and only artistic director at Artists Repertory Theatre, Allen Nause’s retirement is hardly the final act. 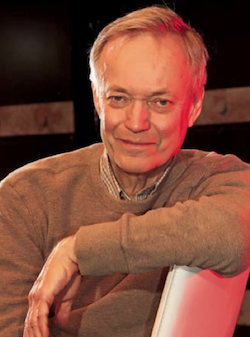 Those retirement plans may not go into effect until June 2013, after Allen Nause has once again guided Artists Repertory Theatre into new territory—that of another artistic director. But when he bows out, Nause will have led Artists Rep for 25 years. The reason that Artists Rep flourished under Nause, becoming a sustainable business with an annual budget of $2.2 million, was due to his ability to simultaneously work in the past, present and future. Even with the constant flow of productions in the present, Nause always stayed conscious of his company’s history while progressing forward according to Artists Rep’s declared mission and his personal creative vision. 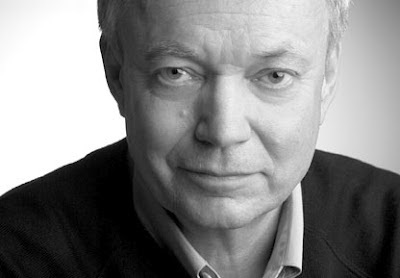 This awareness helped Nause foster dedicated actors and audiences as he sought risks and faced them head on, enabling growth for everyone involved. Part of that development included collaboration outside his culture. An avid traveler, Nause has taught, performed and directed plays across the world—from Africa to Asia and the Middle East, in locations as diverse as India, Hungary, Vietnam, Pakistan, and Israel. Define what an artistic director does. I get to help, enable, promote the making of art. Specifically, I do that by selecting a season, hiring the directors, directing a couple of plays myself, casting, fundraising. I always like to say I’m working in the present—I always have a project I’m working on. I have one foot in the past because Artists Rep has a history, a vision and a mission, and we try to stay true to that. But we’re also moving forward, so I’m also working in the future. I really love that part of it, the strategic planning—planning for the season, planning for what Artists Rep is going to look like in a few years. That’s the overview, and then specifically, I oversee all artistic and production elements at the theater. We have an administrative head, and I’m the artistic head. I supervise all the production, technical elements, designers, actors, directors, et cetera. Did you first come to Oregon for the Oregon Shakespeare Festival? Instead of focusing on my acting, I started focusing on my directing. I started directing at various theaters in town, and then this little company named Artists Rep was looking for an artistic director. Vana O’Brien, who was one of the founders and who’s still with the company, said, “I think you should apply for this, Allen.” And I said, “I don’t know anything about being an artistic director” [laughs]. She said, “I think you have all the right qualities.” What better way to learn but with a tiny company? I’d worked at these huge, monster companies—the Oregon Shakespeare Festival and Seattle Rep, the largest companies in America—but at this little, tiny company I thought I could really make a difference. I could really learn and it’d really be a hands-on experience. Then in three to five years I’d use that to move to another company. And I’ve just been here ever since [laughs]. You were there with talent like William Hurt, an Academy Award-winning actor, Jean Smart, and Denis Arndt, who directed your first production this season, God of Carnage. Tell me about a memorable experience from that early period in your career. There’s something about acting and theater... I think when most people see someone on stage they go, “Those people must be so confident, self assured and having fun.” But the opening night of Much Ado About Nothing when I was playing Benedick (Benedick comes on late in the first scene, so I’m waiting backstage), I just remember absolute fear, believing I could not walk out on that stage. Then my cue came and I just had to go. You walk into the fear. In retrospect, I understood that in order to actually move ahead and grow as a person, you need to look at your fear and walk into it. There have been times in my life since then when I think, oh, I’m too afraid to do that, or, why do I think I could do that? I just find the courage to walk into it and that’s where most of my growth has been, as an artist and as a person, when I’ve actually done the things that are the toughest for me. Have you experienced anything like that recently? I experience it all the time. Every time I face a new production as an actor. You still have self-doubt and you wonder if you’ve got the stuff to really do this role. Every new show as a director, it’s like you’re going into unknown territory. The thing about really good artists is that they’re not repeating themselves. Each project, you’re going into new places of discovery and that’s scary because we like to do what we know. But good artists go some place they’ve never been, and that’s scary because that implies risk and risk means you could fall flat on your face [laughs]. Speaking of unknown territory, what was going through your mind when you accepted the job as Artists Rep’s first artistic director? I thought, what the hell am I doing? They’re going to catch on to me any day [laughs]. Nobody goes to school to be an artistic director; there’s no program. Essentially you’re hired for your artistic taste, your ability to have an artistic vision, and your leadership abilities—the ability to inspire other people. And then, the nuts and bolts of it, you learn on the job. It was a perfect thing for me because I’ve absolutely loved it, especially the visioning part... the looking out to “Where can this company go?” Within the very first weeks I was thinking, what do I want this company to look like in five years? And I remember saying to myself, “As soon as I feel that this company isn’t moving forward anymore, then I’ll probably do something else.” But the company has kept growing, it’s kept moving ahead. I feel confident now that I can pass it on to the next person and they can take it even further. It’s been an amazing growth. We started as a company with a budget of about $125,000 to now $2.2 million, and we have our own space—two theaters. It’s just been this slow, steady growth because we’ve been committed to a longtime mission that’s been pretty clear for us. You helped build Artists Rep into Portland’s second-largest theater company, where you’ve stood for some 10 years now. As the number two player in town, you’re currently balancing in this theatrical middle ground—you don’t have the budgets, stages or productions that Portland Center Stage has, but you’re not on the bottom rung anymore. How do you plan to maintain the intimate, thought-provoking performances that challenge audiences as you continue to grow, reaching a large enough audience to sustain your future operations? We have this attitude that we try to do a lot with a little. If you looked at what we actually budget for sets and costumes, we actually create quite a bit with a little. We have that attitude, but we always like to say we’re fiscally conservative but artistically hungry, risky. I think it’s articulating a clear mission, knowing who you are, and staying true to that mission. It’s also important that you don’t rest on your laurels. We always have to have things we’re shooting for and working towards. Staying true to our mission has held us in good stead. To challenge audiences and artists with plays that matter, that are about our lives. Plays that are premieres—to Portland or a world premiere—or a classic that’s reimagined. The part that I keep coming back to when I’m looking at work is this: How does it challenge us? How does it make us see ourselves as human beings in a different way? Artists Rep has been selected for numerous awards during your tenure, but how have these achievements affected your life? Awards are nice and I’m always touched and honored, but we don’t work for awards. The “Shakespeare in American Communities” grant that we got from the NEA was exciting. It enabled us to do something that is a part of Artists Rep—it’s not in our mission per se, but it’s a part of our character—and that’s international collaboration. We were able to do this project with a Vietnamese company, where we had American actors working with Vietnamese actors, each bringing their own culture together and creating a piece that had us look at each other’s culture. By looking at each other’s culture, it told us more about ourselves. We were able to tour that, not only in Vietnam, but in five states in the United States and here in Portland. It was life changing for all the actors who worked on it; it was life changing for me. And the people who saw that production—it was an eye-opening piece for them. How was it life changing for you? For one thing, I got to go over and live in Vietnam for five months. I had to work with all these cultural differences with these actors, these incredible actors over there, but we certainly had cultural differences that we had to confront. And when you confront cultural differences, it really tells you a lot about yourself. You really see yourself in a new way. It pushed me in every way possible: artistically and as a human being. I made bonds with people there that I still have today, and it started me on this path of doing international work. I recently did a piece in Pakistan, and I’ve worked in Jerusalem and India. Artists Rep has taken three international tours. I think this is so important because I feel the world is shrinking—our communication today is amazing, and we’re not nearly as isolated as we were 20 years ago—and it’s really important that we get out there and work with people. It’s when we work one on one with another culture that you really begin to understand that other culture, and you find the humanness in each culture. You find the things you share, celebrate your differences, and solve problems together. That’s what we do when we create theater—we work together, we solve the problem of getting this play up. The problems are magnified a hundredfold when they’re cross-cultural. Even though you’ll be involved with Artists Rep and the selection process of a new artistic director, retirement must mean you’ll be looking forward to traveling more. I do plan to do more of that. One of the things that I always try to do when I do international work is find a way to bring some of it back here. For example, bringing the Vietnamese piece here. We brought over an actor from India to be in one of our productions. I’m trying to get a Pakistani actor to come over and be in our next season. You’re also considering returning to Pakistan in the future? Yes, but that’s not finalized yet. The State Department is interested in me going there so we’re trying to work that out. That would be next year. Tell me about your past experience there. My experience was fabulous. I worked with a young company in Islamabad. I directed Neil Simon’s The Odd Couple in English. They were eager to learn because there is almost no training. They were very interested in an American approach to the work, and I worked a lot on bringing some of the kinds of approaches to the work that I use here—basic acting stuff for us, but it was stuff that they hadn’t been exposed to there. I found them very welcoming, kind, enthusiastic people. for me was a 10 o’clock end time was absolute because that’s when the electricity shut off [laughs]. So if we started 15 minutes late, I couldn’t go 15 minutes over. What is special about live theater? It’s ultimately risky. Anything can happen. Risk taking has defined your career to some extent. When you sit down and there’s a live actor in front of you, the potential is endless. In a movie, as brilliant as they are, it’s always going to be the same, every time you watch it. But every performance is different. The audience makes it different. It’s that communication between the two; it’s a very special thing. They’ve been doing the death knell on theater since movies came in, and then television, but I think theater just keeps getting stronger because nothing can replace that live experience. What’s special about the current theater community in Portland? One of the gratifying things about Portland is there’s a lot of smaller companies right now that are doing really interesting, challenging work. There are three or four of them that could go on that path to creating an institution that has some longevity and growth. Sometimes we see companies come and go. I never wanted Artists Rep to be one of those companies. I felt it was more important to build a company that could be sustained beyond me, and I think there are some young companies right now that are laying really good groundwork. There’s just great work being done and new people moving here all the time. People think that we’re all in competition, but it really isn’t that way. The more successful other companies are, the better it is for us because it attracts artists. It keeps the community vital. We can’t employ all the actors here, so they have other places to work. It enriches the community. You’re leaving behind some pretty big shoes to fill. Have any advice for your successor? [Laughs] I’m really excited about the next stage of Artists Rep and being part of that. Back when I came to Artists Rep in ‘88, it was such a small company. The company now has an opportunity to do a national search and get someone that’s a really good fit. What’s important is for that person to have one foot in the history [the past], and certainly their heart in the present. But also looking to the future, they need to have their own vision that grows out of who we are now, where we’ve been, and where we’re going. And that’ll be different from mine. The only advice I would have is, continue to take risks and be true to the mission of the company and true to your own vision. Could you possibly envision the next person to be here for 25 years as well? Yes, I can. It has been, for me, a truly gratifying company to work for. This company is going nowhere but up and better and stronger. And how do you hope to continue to grow after your retirement? I’m going to continue to act, and I have continued to act as long as I’ve been here. That’s really been good for me and good for the company because I give myself that ultimate risk occasionally. It’s really great [laughs] for the big things, the risk and the creativity, but also the small things... I get to see what actors go through to work here—what the dressing rooms are like, if the heat’s not working. I always tell people when we start rehearsal, “I’m not the artistic director anymore. I’m just an actor.” And I really feel that way. The biggest thing for me in the next few years as I transition into retirement, will be focusing more on myself as an artist, moving away from some of the administrative stuff. I’ll be able to work at other companies and direct other places. I enjoy doing all those things because each is a challenge in a different way. What’s your next acting role? Proudly spotlighting Portland's coffee culture, we published a roundup of local micro roasters last month. Hopefully a full month has given you time to visit each Courier, Ristretto and Stumptown location, but now it's time for the second installment in our micro roaster series. Why frequent corporate coffee chains when every quadrant of this city features not only an abundance of local coffee shops but also locales where you can see your beans roasted before they become your brew? With some 30 local micro roasters in Portland, here are a few more local alternatives to Starbucks. Leave it to a Finnish pro snowboarder to stop seeking adventure on the slopes and start one of SE Portland's most beloved coffee shops and roasteries. In 2009, an inexplicable love for coffee fueled Wille Yli-Luoma with more thrill than riding big mountains, and he put his energies into opening Heart. Alongside wife Rebekah, the need to take risks and face the unknown manifested itself in the business of coffee roasting, and the Yli-Luoma's have succeeded as an integral part of Portland's collaborative coffee culture. "Collaborating with other local businesses is a great way to develop a stronger sense of community and economy," Rebekah Yli-Luoma says. "On one level of collaborating, we serve baked goods and sandwiches that come from local businesses across the city: Bakeshop, Florio, Fressen, Lauretta Jean's (kiosk), and Meat Cheese Bread. 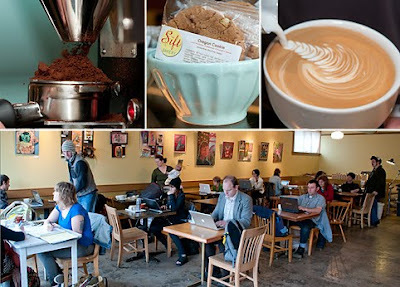 Each of these businesses compliment Heart coffee and we stand behind each of them. We also use Sunshine local dairy. "On another level, Heart has recently worked with Holden. We are both locally owned and operated companies that aim to bring the best product to our consumers that we can." The superior snowboarding outerwear designers recently teamed up with the micro roasters to create an environmentally conscious coffee from sustainable Brazilian farms packaged in "the first biodegradable, one-way valve coffee bags available in the Pacific Northwest," according to Transworld Snowboarding. 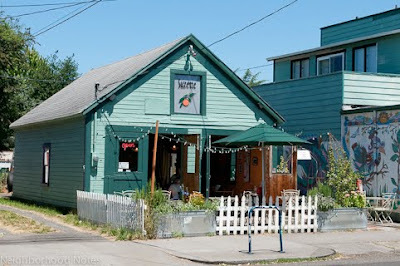 Read the rest on Heart plus other PDX micro roasters, including Extracto and Cellar Door, on Neighborhood Notes. What will happen to your business when you retire? Do you plan to sell it? Hand it down to your kids? Or will you simply have a sale and close up shop? Your business can have a life beyond you, the sole proprietor, but it takes planning. And this planning will not only benefit you 20 years down the line, it will also help you create stability, make decisions, and even expand your business in the present. According to Katrina Scotto di Carlo of Supportland, when you start your business, you should be thinking with the "acquisition mindset" of a start-up, which prepares from day one to be acquired by keeping operations in order while constantly identifying a "value to the market or community." On the contrary, many small business don't often plan for what will happen when the owner, often the heart, soul and curator of the business, departs. Many boutique owners may wonder how their business could continue without the principal tastemakers in house, but is there no value in the name or brand you've created, the relationships and supply chains you've established, the people you employ, the products you sell, or the services you provide? 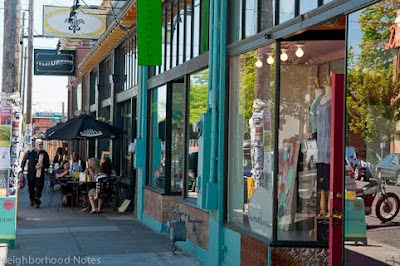 Scotto di Carlo maintains "most business owners in Portland close shop not so much by choice but because they find themselves in a situation which forces that choice. Thing is, there's plenty of choices. It's just that several of the more attractive ones need thoughtful planning sometimes years in advance," like preparing your business for sale. "Most business owners will spend approximately 80 hours on average building their business plan," says Michael P. Roy of Business Exit Timing. "And this is when they really don't have anything [like assets]. They spend an average of less than six hours figuring out ultimately how they're going to liberate themselves from their business." Roy finds these actions incomprehensible as he believes that leaving a business is "probably the most significant, complex and important financial decision a business owner will make." "If the biggest cause of failure is lack of planning," Roy says, "then why don't you spend and invest more time in planning how ultimately you want to leave your business?" The goal of exit planners is to help small business owners design and implement "a written, formal exit plan—something that severs as a roadmap, that can empower and guide you through the exiting process"—whether you plan to sell to a third party (which Roy says only 20 percent of businesses actually succeed in doing), pass down to employees or family, or even close. No matter what you intend to do, Roy emphasizes contingency planning, which will help you exit your business or prepare for the unexpected. Planning how to exit your business may also be an opportunity to organize and grow your business. If you don't have documentation of how your business functions, how would you ever go on vacation without closing your doors for a week? Or, more seriously, what would happen if you were injured or hospitalized? As composer Evan Abeele and vocalist Denise Nouvion prepared their debut album for release on the last Tuesday of February, the comparisons to Beach House continued to pour in. It's an apt description, but on The Slideshow Effect, Ontario's Memoryhouse pulled inspiration from some past classics (Emmylou Harris, Dusty Springfield, Fleetwood Mac) dropping the reverbed sound of previous recordings (from 2010's The Years) and putting Nouvion's beautifully delicate vocals at the forefront, kissing you before Abeele's compositions float forward to make the contact of a full embrace. The warmth is then multiplied by the presence of a smidgen of Canadian country as several of the 10 tracks feature the delicate twang of a pedal steel. And although Nouvion may audibly lead on the Sub Pop-released record, Abeele has gained more confidence in his production (with the help of friend, collaborator and occasional Memoryhouse bassist Barzin Hassani Rad), pushing his compositions to include guitars, piano, Rhodes, bass, vibraphone, Hammond, and Juno keys on The Slideshow Effect—which you can watch in its entirety below (images provided by Nouvion). Approaching the tail end of a 15-date North American, with a European tour to follow, Memoryhouse's Evan Abeele answered a few questions for OMN via email in advance of their Sunday, March 11th show at Bunk Bar with PDX via Ft. Lauderdale's Arrange (aka the 19-year-old Malcom Lacey). Tell me how the title of your new album, The Slideshow Effect, and even your band name, Memoryhouse, aptly describe the concept behind your debut album. I think the idea we wanted to explore on our album was that it's not what your remember, but how you remember. All of those loose, messy narrative threads that shape your life based on how you process people/places/events. I think it's a relevant point of discussion since there has been such a critical turn towards nostalgia in popular culture, especially in music as of late. You've been quoted discussing the timelessness of your sound saying, “I think the sound we have right now fits ‘out’ of time, but, obviously, is still ‘in’ our time. It’s something that could have happened many years ago, but it also sounds contemporary.” What influenced you musically on this record? I like albums that bring you into a specific world created by the artists, so that was something I really turned to for inspiration. Albums like Dusty in Memphis are really cool—the instrumental palette is consistent through the record, but remains varied and just generally deepens as the record progresses. Plus you never lose Springfield's voice in the recording. I saw a lot of similarities between her and Denise so I wanted to implement a similar approach for our record. Portland and Austin share many things in common, such a wicked, healthy and nurturing independent music scene. Parts of each town even resemble the other. South Austin feels like inner-eastside Portland as it is the Texas capitol’s bohemian part of town with all its taquerias, art shops, funky, yummy cafes, and fabulous dive bars—many of which blossom into make-shift concert venues each March. This March 13th through 18th Oregonians, by birth and naturalization as well as those who have moved onto to sunnier cities, will take the dive bar, music biz party, and official showcase stages of Austin. Here are a few notables that have come through the OMN inboxes (and a zillion more that we're not intentionally omitting!). 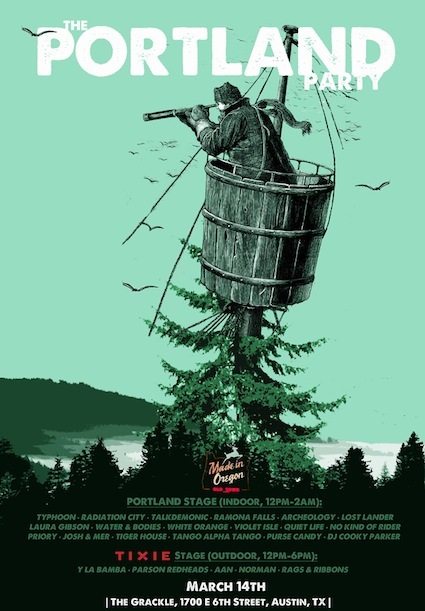 And March 14th is the big Portland... well, it's The Portland Party. Duh. RSVP here. At The Grackle on 6th Street (1700 E. 6th St., Austin, TX 78702). As Portland brings our own showcase to Austin from 12pm to 2am on Wednesday, there will be two stages—the Portland Stage from 12pm-2am (indoors, 21+) and the Tixie Stage from 12pm-6pm (outdoors, all ages). Plus free beer, free coffee, and free vodka. Mixed. Together. Just ask for a Bridgetown Nip. Here's the important info—the free booze power hours—free Stumptown Coffee and Bloody Mary's with 360 Vodka from 12pm-1pm followed by free Deschutes beer and vodka specials from 6pm-7pm. Get the complete Portland Party lineup and more on PDX acts at SXSW on OMN.